Russian submarine-launched ballistic missile. First intercontinental submarine-launched ballistic missile (range 7800 km). First flight 1969. Development completed 1973. 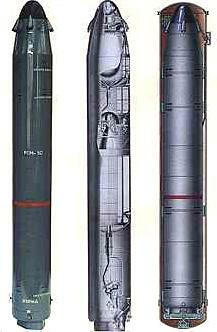 The variants of this missile were given three different DoD designations over the years (SS-N-8, SS-N-18, and SS-N-23). AKA: 4K75;D-8;RSM-40;Sawfly;SS-N-8 Mod 1;Vysota. Status: Active. Payload: 680 kg (1,490 lb). Gross mass: 32,800 kg (72,300 lb). Height: 13.20 m (43.30 ft). Diameter: 1.80 m (5.90 ft). Span: 1.80 m (5.90 ft). Maximum range: 7,700 km (4,700 mi). Number Standard Warheads: 1. Warhead yield: 1,000 KT. CEP: 1.56 km (0.96 mi). Boost Propulsion: Storable liquid rocket. Initial Operational Capability: 1973. Layner Russian missile derived from R-29RM SLBM. R-29D Russian submarine-launched ballistic missile. First flight 1976. Development completed 1974 according to Makeyev. R-29K Russian submarine-launched ballistic missile. First flight 1977. R-29RM Russian submarine-launched ballistic missile. SLBM on Delta 4 subs. First flight June 1983. Developed 1973-1986. Shtil' Russian intercontinental ballistic orbital launch vehicle. Three stage vehicle based on R-29RM SLBM. Shtil'-1 Russian intercontinental ballistic orbital launch vehicle. Three stage vehicle based on R-29RM SLBM. Shtil-2/2N Russian intercontinental ballistic orbital launch vehicle. Three stage vehicle based on R-29RM SLBM with a special shroud. Liftoff mass 40 metric tons. Stationary launch platform. Shtil-3A Russian intercontinental ballistic orbital launch vehicle. Proposed four-stage air-launched orbital launch vehicle based on R-29RM SLBM. Ignition mass 46 metric tons. Shtil-3N Russian submarine-launched ballistic missile. Proposed orbital launch vehicle based on R-29RM SLBM with new third and additional fourth stages. Stationary launch. Liftoff mass 46 metric tons. Sineva Russian liquid-propellant submarine-launched ballistic missile derived from R-29RM. First launch 2004-02-18; entered service 2007. Competitor was the solid-propellant Bulava. Volna Russian launch vehicle based on surplus R-29RL submarine launched ballistic missiles. Suborbital and orbital versions. Payload volume 1.3 cu. M. Payload 115 kg to 3000 km or 1250 kg to 200 km altitude suborbital trajectories, or 120 (260 lb) kg to a 200 km orbit. Liftoff mass 34 metric tons. Vysota Russian intercontinental ballistic suborbital launch vehicle. Two stage vehicle based on R-29D SLBM. Suborbital; 30-55 min zero G. Payload volume 0.7 cu. m. Payload 115 kg to 5200 km or 1150 kg to 200 km. Liftoff mass 33 metric tons. Family: submarine-launched. Country: Russia. Spacecraft: Parus, Tubsat, Kompas. Agency: Makeyev bureau. Bibliography: 193, 2, 279. 1998 July 7 - . Launch Site: Barents Sea Launch Area. Launch Pad: 69.5 N x 34.2 E. Launch Platform: K-407. LV Family: R-29. Launch Vehicle: Shtil'-1. Shtil 1 - . Payload: Shtil-1 instr. package. Nation: Israel. Manufacturer: TuB. Spacecraft: Shtil. Decay Date: 2014-05-08 . USAF Sat Cat: 25391 . COSPAR: 1998-042C. Apogee: 801 km (497 mi). Perigee: 401 km (249 mi). Inclination: 79.00 deg. The first satellite launch from a submarine. The Shtil-1 launch vehicle was a converted R-29RM (RSM-54) three stage liquid propellant submarine launched ballistic missile made by the Makeyev design bureau. The satellite payload is placed in the standard R-29RM reentry vehicle. The launch plaform was the K-407 Novomoskovsk, a 667BDRM Delfin class submarine of the Russian Northern Fleet's 3rd Flotilla. Launch was from the Barents Sea at 69.3 degrees N x 35.3 degrees E. The Shtil contained an Israeli instrument package. 2003 September 2 - . Launch Site: Okhotsk. Launch Platform: K-223. LV Family: R-29. Launch Vehicle: Volna. (Chizha) - . Nation: Russia. Apogee: 1,000 km (600 mi). 2006 May 26 - . 18:50 GMT - . Launch Site: Barents Sea Launch Area. Launch Pad: 69.5 N x 34.2 E. Launch Platform: K-84. LV Family: R-29. Launch Vehicle: Shtil'-1. Kompass-2 - . Mass: 80 kg (176 lb). Nation: Russia. Agency: Izmiran. Manufacturer: Makeyev bureau. Class: Technology. Type: Navigation technology satellite. Spacecraft: Kompas. Decay Date: 2011-12-28 . USAF Sat Cat: 29157 . COSPAR: 2006-019A. Apogee: 492 km (305 mi). Perigee: 402 km (249 mi). Inclination: 78.90 deg. Period: 93.50 min. Complex Orbital Magneto-Plasma Autonomous Small Satellite. Earthquake research satellite for the Moscow-based IZMIRAN science institute. The satellite carried detectors for electrons, UHF/VHF waves, UV emission and radiation, a radio frequency analyser for electric field waves, and a Mayak ionospheric beacon. Reports indicated that the satellite did not respond to ground commands and that its mission was abandoned. 2008 August 1 - . Launch Site: Barents Sea Launch Area. Launch Platform: K-44. LV Family: R-29. Launch Vehicle: Volna. (Kura) - . Nation: Russia. Apogee: 1,000 km (600 mi). 2008 October 11 - . Launch Site: Barents Sea Launch Area. Launch Platform: K-114. LV Family: R-29. Launch Vehicle: Sineva. (Pacific) - . Nation: Russia. Apogee: 1,000 km (600 mi). 2008 October 12 - . Launch Site: Barents Sea Launch Area. Launch Platform: K-84. LV Family: R-29. Launch Vehicle: Shtil'. 2008 October 12 - . Launch Site: Okhotsk. Launch Platform: K-506. LV Family: R-29. Launch Vehicle: Volna. 2009 July 13 - . 01:20 GMT - . Launch Site: North Pole. Launch Platform: K-84. LV Family: R-29. Launch Vehicle: Shtil'. Kura - . Nation: Russia. Apogee: 1,000 km (600 mi). 2010 October 28 - . Launch Site: Okhotsk. Launch Platform: K-433. LV Family: R-29. Launch Vehicle: Volna. RV x 4 - . Nation: Russia. Apogee: 1,000 km (600 mi). Operational test..
2010 October 28 - . 10:30 GMT - . Launch Site: Barents Sea Launch Area. Launch Platform: K-117. LV Family: R-29. Launch Vehicle: Sineva. 2011 May 20 - . Launch Site: Barents Sea Launch Area. Launch Platform: K-84. LV Family: R-29. Launch Vehicle: Layner. 4 x RV - . Nation: Russia. Operational test..
2011 July 27 - . Launch Site: Barents Sea Launch Area. Launch Platform: K-84. LV Family: R-29. Launch Vehicle: Sineva. RV x ? - . Nation: Russia. Apogee: 1,000 km (600 mi). Test mission. Launched from the Barents Sea to the Kura test range..
10 RVs - . Nation: Russia. Apogee: 1,000 km (600 mi). R&D mission. Second test flight of the R-29MU2.1 Layner missile from submarine K-114 Tula. The R-29MU2.1 is a version of the R-29MU2 Sineva missile but carrying up to 10 reentry vehicles..
2012 October 19 - . Launch Site: Okhotsk. Launch Platform: K-433. LV Family: R-29. Launch Vehicle: Volna. RV x 4 - . Nation: Russia. Apogee: 1,000 km (600 mi). Operational test launch of an R-29R SLBM from the K-433 submarine in the Sea of Okhotsk to the Chiza test range..
2013 October 30 - . Launch Site: Barents Sea Launch Area. Launch Pad: K-117. Launch Platform: K-117. LV Family: R-29. Launch Vehicle: Sineva. RV - . Nation: Russia. Apogee: 1,000 km (600 mi). 2013 October 30 - . Launch Site: Okhotsk. Launch Platform: K-433. LV Family: R-29. Launch Vehicle: Volna. RV - . Nation: Russia. Apogee: 1,000 km (600 mi). Launched from a sub in the Sea of Okhotsk to Chizha. One of a series of missiles launched on the same day as part of a large scale Russian military exercise..
2014 May 8 - . Launch Site: Barents Sea Launch Area. Launch Pad: K-114. Launch Platform: K-114. LV Family: R-29. Launch Vehicle: Shtil'. Shtil' RV - . Nation: Russia. Apogee: 1,000 km (600 mi). Military Exercise. 2014 May 8 - . Launch Site: Okhotsk. Launch Platform: K-223. LV Family: R-29. Launch Vehicle: Volna. Volna RV - . Nation: Russia. Apogee: 1,000 km (600 mi). Military Exercise. 2014 November 5 - . Launch Site: Barents Sea Launch Area. Launch Platform: K-114. LV Family: R-29. Launch Vehicle: Sineva. 2015 October 30 - . Launch Site: Barents Sea Launch Area. Launch Platform: K-117. LV Family: R-29. Launch Vehicle: Sineva. R-29RM RV x 4 - . Nation: Russia. Apogee: 1,000 km (600 mi). Test mission. Impacted Kura, Kamchatka..
R-29 RV x 4 - . Nation: Russia. Apogee: 1,000 km (600 mi). Test mission. Impacted Kanin Penisula..
2015 December 12 - . Launch Site: Barents Sea Launch Area. Launch Platform: K-51. LV Family: R-29. Launch Vehicle: Sineva. RV x 4? - . Nation: Russia. Apogee: 1,000 km (600 mi). Test mission. Impacted in Kura, Kamchatka..
2016 October 12 - . Launch Site: Okhotsk. Launch Platform: K-433. LV Family: R-29. Launch Vehicle: Volna. RV - . Nation: Russia. Apogee: 1,000 km (600 mi). Test mission. Impacted in Chiza..
RV - . Nation: Russia. Apogee: 1,000 km (600 mi). Test mission. Impacted in Kura..
2017 October 26 - . Launch Site: Sea of Okhotsk. Launch Platform: Sub. LV Family: R-29. Launch Vehicle: Volna. RV - . Nation: Russia. Apogee: 1,000 km (600 mi). Test mission. Impacted Chiza..
2017 October 26 - . Launch Site: Barents Sea. Launch Platform: Sub. LV Family: R-29. Launch Vehicle: Sineva. 2018 October 11 - . Launch Site: Sea of Okhotsk. Launch Platform: Sub. LV Family: R-29. Launch Vehicle: Volna. RV x 4? - . Nation: Russia. Apogee: 1,000 km (600 mi). Military exercise launch. Impacted Chiza. RV x 4? - . Nation: Russia. Apogee: 1,000 km (600 mi). Military exercise launch. Impacted Kura.